Nearly five years ago I picked up an old wooden crate on a day trip to the Hudson River Valley region. It was the perfect size to hold on to a good portion of my out-of-control magazine collection and fit nicely into the existing decor. The look was great, but the tiny apartment couldn’t hold more than one. Once we decided to move into a place with a bit more space Brian and I slowly began collecting more and more crates, knowing we would eventually do something with them. We picked up the most interesting ones (with cool labels or brand logos on them) at antique stores, salvage yards and garage sales in the Catskills and paid between $5 and $40 a piece for each. As the collection slowly grew in the corner of a room, one box stacked upon another, the plan for their use nearly formed all on its own: a wall unit. 1. You must clean the boxes before you work with them. Don’t worry that cleaning them up will take away from the rustic look. I guarantee these boxes will be dirtier than you think! If possible, do this step outside. Gently rub all surfaces of each crate with steel wool, discarding dust and dirt as you go along. Once done, use a tack cloth to remove any excess debris you might have missed. Dilute the Murphy’s Oil Soap according to package directions and gently wipe down each crate with a cloth soaked in it. Set aside until dry. 2. Stack the boxes in a configuration that works for your needs while trying to keep balance and support in mind. Placing heavier boxes at the bottom of a stack will help make your unit more stable. Let your final configuration sit in the room for a few hours or a few days if you can. We moved ours around several times before we found a look and fit we were happy with. 3. The number of mending plates, corner braces, screws and anchors you will need will vary based on the size of your unit. Mending plates are used to connect the crates to one another and the corner braces are used to secure tall stacks to the wall. Check your screws and make sure they are shallow enough to go into the back of each crate without piercing through to the other side. For us, 1/4-inch screws worked just fine. For each corner brace, you’ll need two shorter screws that will be connected to the crates and two longer screws with matching anchors that will go into your wall (the type of anchors you’ll used should be based on your own wall). 4. Make sure the backs of all of your crates are lined up so they are flush with each other. For each crate that you connect to another crate, you’ll need two mending plates, one for each corner that butts up to another crate. Slowly screw a plate into each corner (see example in slideshow above) and build up until you have a tower the size you would like. Continue connecting crates and building your stacks until all are complete. 5. Check to see how level your stacks are and add wooden shims if necessary. 6. It’s important to secure the larger towers to the wall to make sure they won’t topple if they are bumped or pulled on by animals or little ones. Work from the middle (this should be your tallest section) out. To secure, affix a corner brace to your wall using the longer screws and matching anchors (see example in slideshow above). Slide your stack of crates into the brace and use a smaller screw to affix the brace to a wooden crate. Depending on the height of your stack, you may want to use more than one brace. Be sure to affix the brace at least midway or higher and also at a spot that will be hidden by your next stack of crates. Continue until all crates are secure and your unit is done. SWWU Tip 1: You can find vintage wood crates all over the place: garage sales, salvage yards, antique stores and on websites like Etsy and eBay. We also got quite a few of ours from a local apple orchard, which was able to sell us some sturdy used crates for only $5 a piece. They were a great supplement to the more ornate crates, which we made sure to put on the outside of the unit where their colorful details could be on display. SWWU Tip 2: We connected crates in vertical stacks and didn’t find a need to connect them horizontally. If your flooring is uneven or your boxes aren’t matching up very well, you may want to add additional braces for support. 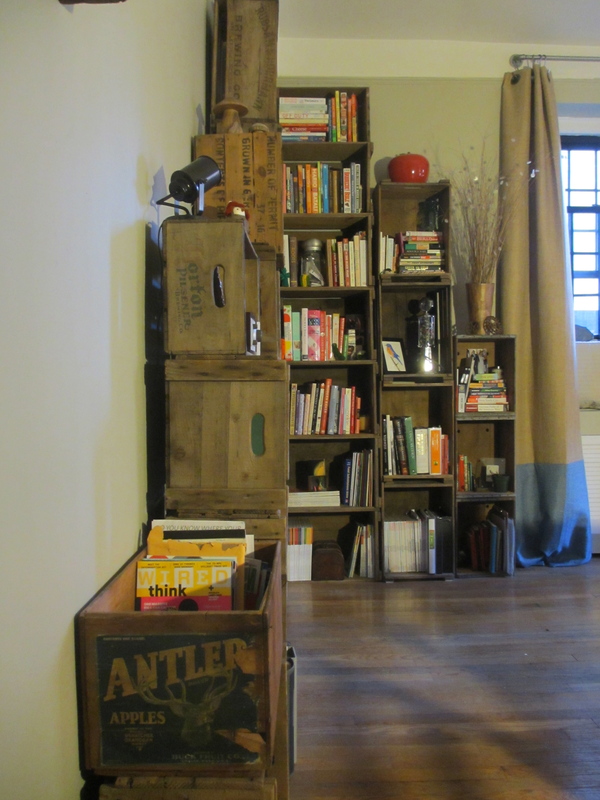 This entry was posted in At Home and tagged @SWWUblog, antique, at home, DIY shelving, home decor, home projects, salvage vard, upcycled, vintage wooden crate shelving, vintage wooden crate wall unit, wine box, wine crates by Something We Whipped Up. Bookmark the permalink. you both are very cratetive tee hee, It really looks crate in ur place. craten things is fun. ok im done . Great vintage look! Working with mending plates is clever and effective.